Whitelist Report was built out of pure laziness. 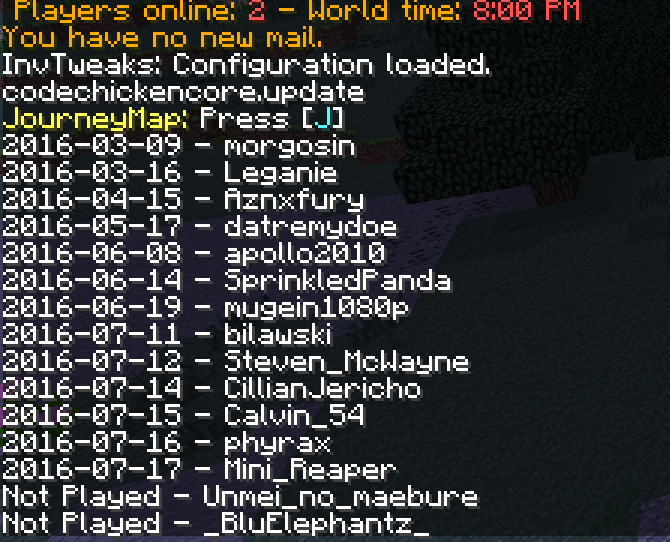 I was tired of having to type /seen <playername> to see when users were last online; and given the possible size of some white-listed servers, I'm sure you'll agree. SO, why not leverage the bukkit API and do that for me. Simply put, with one command I can now display the dates users were last online. This is the resulting output from the command, a date-sorted list of players and their last played dates. As well as a list of players who have yet to join. Donations are definitely not required, I'm a coder, I code for a living. Java is a hobby, while PHP is my day-to-day work. These are perhaps more important to me than donations. Without reviews, we - as developers - never grow. We rely on our reviews no matter how bad they are. So please, once you get a chance to use this plugin, write a lengthy review on it, if not to at least help others.